Pleasing Features-Cloistered Walks and Large Quadrangles. Elmgrove Public Elementary School, which was opened yesterday, is a decided acquisition to the Bloomfield district of Belfast and has a number of remarkable features. Situated in sylvan surroundings and with al1 the appearance of an aged seat of leaming, it has cloistered walks, spacious quadrangles, and concrete playgrounds. An imposing central hall situated on a slight plateau fronting the road is flanked on one side by the single-story junior school and on the other by the two-storied senior school. Since the commencement of the school building programme some years ago the method of construction - of ensuring that teaching should be conducted under the most modern conditions - have altered considerably and to-day with Elmgrove School in the process of completion, Belfast has attained a proud position in the building of educational establishments. Few educational buildings have such a prepossessing appearance. The grounds are completely enclosed by massive railings and bordered on one side by the Connswater. The extensive inclined frontage down to the road is planted with trees. The best way to handle such a peculiar site presented some diffienlty at first, but the planning has been carried out remarkably well. Although the school is not yet quite finished 654 pupils crowded into the already completed classrooms. The children came fnom St. Donard's, Beersbrldge, and Simpson Memorial all of which schools have been closed down. The pupils wilI be further augmented by another batch from the overcrowded McQuistoll Memorial P.E.S. Elmgrove when finished will house over 1,000 scholars. The principal is: Mr. J. Sullivan. and the large teaching staff is composed of Messrs. A. Marks, J. Biggart Hamill, and A. McRoberts, and Miss E. Kinley, Mrs. Rogers, Mrs. Crawford, Mrs. Hayes Mrs. Scott, Mrs. Shearer, Miss Scott, Miss. Larmour, Miss Livingstone, Miss Barton, Mrs. Archer, Miss Douglas, and Miss Biggart. It is expected the school will be completed in two months. The grouping of the three sections, which are all connected by corridor, is of a distinctive nature and the rustic brlckwork, and red-tiled roofs are pleasing to the eye. The roofing of the school is original and the row of dormer windows in the upper story of the left wing effectively shows off the tiles on the roof. 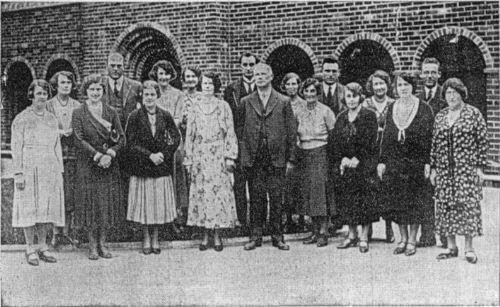 The Staff of Elmgrove Public Elementary School, Beersbridge Road, Belfast, which was opened yesterday. There has been a great advance locally in the manufacture of bricks, and all the bricks of the rustic type have been made in Belfast. Here and there in the hall of the school the architect, Mr, R. S. Wilshere, M.C., A.R.I.B.A., P.A.S.I., has placed a few bricks of a different colour and type from the rest, and this has added to the attractiveness of the walls. Senior school classrooms are placed round a quadrangle, and the junior school is built on the same plan. The junior school is all on the ground floor, while the senior building has one two story wing. This difference in the schools was dictated by the necessity to provide in the senior block the customary rooms for the teaching of special subjects - art, science, woodworking, and domestic economy. The upper story of the front wing is mostly occupied by two of these rooms - the cookery room and the science room. Chiefly for reasons of economy these rooms are partly in the roof - hence the dormer windows- so that this attractive feature is not placed there merely for effect or ornament, but is fulfilling a useful purpose whieh is as it should be. The Beersbridge Road elevations are north side, but none of the classrooms in either school are on this side and they all have the benefit of the south light. On the north side of each section of the school there runs a closed corridor. This corridor has French doors, whieh may be thrown open on warm and sunny days. In the classroom wings the corridor is on the quadrangle side, and having this protection it has been left open except for semi- circular brick arches. The quadrangles are each turfed and flagged, and a sundial has been placed upon one of the walls of the senior school. From the foregoing description of Elmgrove it might be thought that the placing of a two-story wing in line with a single story building would result in a lack of harmony, but such architectural discord has il been avoided. Elmgrove is not built in a line parallel with the Beersbridge Road but runs away at an angle, and the number of trees in the intervening ground make the school surroundings very pleasant indeed. The frontage line of the buildings is not straight but slightly bent, and the two blocks are divided by the assembly hall, which has a beauty of its own. At each end of the two classroom blocks, next to the assembly hall, are tall roofs running at right angles to the main roofs. These roofs have a belcast and their grouping with the roof of the asssembly hall, which also has a belcast, is extremely effective. A cloister formed with brick arches fronts the assembly hall and connects the corridors on the north side of the two story blocks, so that it is possible to pass from one end of the building to the other under cover. It will form another useful purpose by providing for the chlldren. Projecting from the assembly hall is the cinema room, and the building is finished with a stepped brick gable. The classrooms in both schools are of the usual type, with large windows giving almost 100 per cent opening and cross ventilation. In the senior school the special subjects rooms are very Iarge and admirabl equipped for thelr purpose. The art room is a particularly fine chamber, with large bay windows on the west side. In the junior school are two large and pleasant rooms for the infants, with a view across the playgrounds to the Castlereagh Hills. They have french windows opening direct to the playground. The main entrance to the school is in the centre of the two story wing. The doorway, with its recesed arches, is closed by a wrought iron gate, and above will be placed a coloured plaque bearing the Belfast coat of arms. This door gives access to a lobby carried out in brick, with a vaulted ceiling, and beyond that is a further lobby or crush hall with an entrance through to the quadrangle. Off the crush hall is the principal's room, which has cloakroom accomodation attached, and at convenient points in the building there are staffrooms and cloakrooms for the teachers of both sexes. The cloakrooms for the children are placed at the corners of the building, adjoining the pupils' entrances. The interior of the assembly hall is in keeping with the general style of the school. There are tall bay windows in deep recesses, and platform is flanked by brick piers supporting a silver coloured beam. the hall, which is capable of housing a large number of pupils, will be in demand for examinations and school functions. It has even an open timbered ceiling, and the wood is picked out in red and silver. Children From Various Schools who resumed their studies after holidays in the new Elmgrove Public Elementary School, Beersbridge Road, yesterday. The senior school comprises ten classrooms, four subject specialist rooms, principal's room, two staffrooms. medical inspection room, cloakrooms and lavatories for pupils and staff, stores &c.
Junior school - ten classrooms, including two large rooms for infants, two staffrooms, cloakrooms, and lavatories. Each school is a complete unit, and has its own playground covered with concrete. 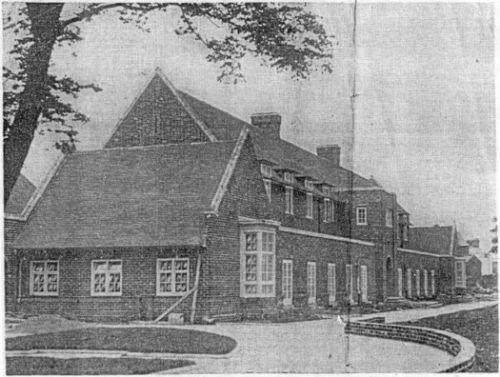 A wide concrete drive runs from the Beersbridge Road entrance along the front of the school, and it has been given a semi-circular sweep opposite the assembly hall, with a turfed plot in the centre. At the Beersbridge Road entrance a caretaker's house will be erected. There is also an entrance to the grounds from Fashoda Street. The whole structure is striking proof of what can be achieved without over elaboration in architectural detail, and depends for its effect solely on grouping, colour, and proportion.